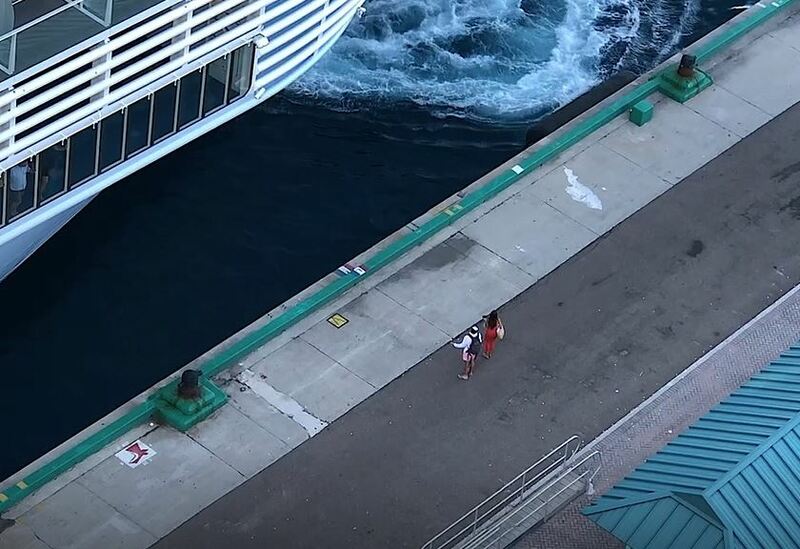 A helpless couple watched their cruise ship sail off into the sunset as it left them behind in the Bahamas. I mean, I say ‘helpless’, they really should have just got back to the ship on time. As anyone who’s been on a cruise will know, those things stick to quite strict schedules. They only have a few hours in between returning to the original port and setting off again with a new wave of holidaymakers, so each stop along the way is only allotted a certain amount of time. You have to jump off, do your sightseeing, maybe pick up an obnoxious-looking magnet to bring home for your family, and get yourself back on board before the bridges connecting land and sea are taken away. If you’re not there on time, well, tough. As this couple learned the hard way. The video was captured by an amused passenger on a neighbouring ship, which had docked opposite the hapless couple’s. 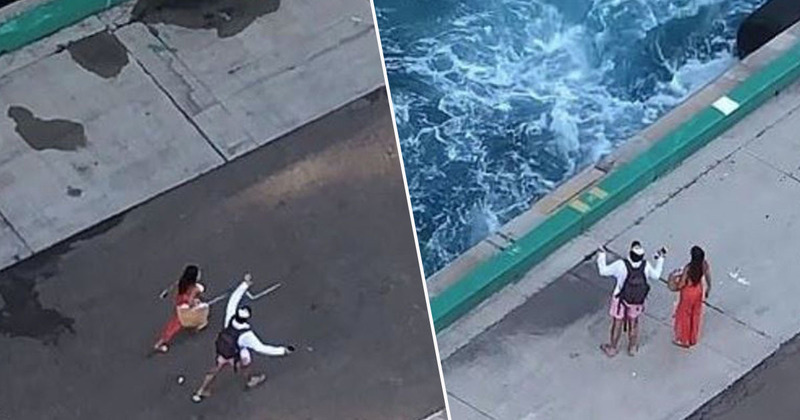 According to them, the couple were holidaying on the Royal Caribbean Symphony of the Seas, which was scheduled to leave Nassau at 4pm. To make sure everyone was back on board on time, passengers were told to return to the ship by 3:30pm. However, the unpunctual couple in question rocked up at 4:15pm. They shouldn’t have really been surprised at the situation that followed. By the time they arrived, the gangways had been pulled back and the ship was preparing to set sail. Desperate, it looks like they tried to try to get the attention of someone on board by shouting and waving their arms, but to no avail. The propellers were set in motion, and the ship slowly began to move away, much to the dismay of the tourists. Admittedly, there are worse places to be stranded than on a luxurious Bahamian island. But at the same time, if the majority of your belongings are being shipped away from you, it’s not really ideal. It’s not really clear what the couple did after they found themselves stranded. Best case scenario, they had the necessary money and documents to arrange a flight back from Nassau. Worst case scenario, they’re still stranded on the dock, waiting for the Symphony of the Seas to return so they can finally make their way home. 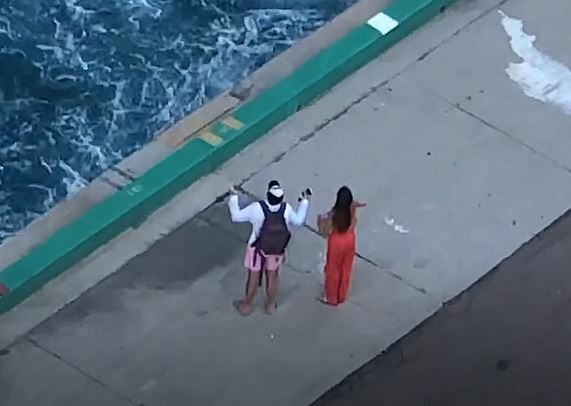 In a bizarre twist, the cruise ship the couple missed in this hilarious clip is the same one an idiot filmed himself jumping from an 11th floor balcony in a clip that went viral in January. Sounds like the Symphony of the Seas is perfect for unforgettable holiday memories.